Toyota Motor Corp posted a 32 percent drop in quarterly operating profit and withdrew its full-year profit forecasts as Thai floods pose a fresh threat to production while supply shortages from the March earthquake kept output low. Toyota is also drowning under a stubbornly strong yen, which is making its annual exports of 1.5 million vehicles from Japan unprofitable and less competitive against cars from rivals such as Hyundai Motor Co.
Once the world's most envied and profitable automaker, Toyota has lost its shine against domestic rival Nissan Motor Co. Nissan last week lifted its profit forecasts as it achieves strong sales growth in developed and emerging markets with popular new models. Toyota said on Tuesday its operating profit for July-September was 75.39 billion yen ($966 million), worse than an average estimate of 101.3 billion yen in a Reuters survey of 12 analysts. Second-quarter net profit was 80.42 billion yen, down 18.5 percent, while revenue fell 5 percent to 4.57 trillion yen. For the year to March 31, 2012, Toyota had forecast an operating profit of 450 billion yen, but it withdrew its full-year forecasts for profit and vehicle sales due to uncertainty surrounding the Thai floods. The consensus forecast was for 486 billion yen in a survey of 21 analysts by Thomson Reuters. The Thai floods have forced Toyota to halt work at its three vehicle plants in its Southeast Asian export hub from Oct. 10 at least until Nov. 12. A shortage of parts has also forced it to reduce production in nine other countries including Japan. 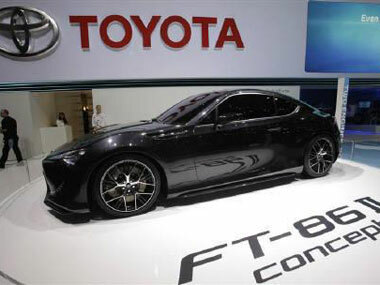 Toyota said on Tuesday it would keep its Japanese production reduced at least until Nov. 18. It was still undecided on production elsewhere, including in Thailand. Between October 10 and November 12, Toyota would lose production of about 150,000 vehicles from the supply shortage, a spokeswoman said. This week, its Japanese factories were working at 70-80 percent of planned levels, while output in the Philippines, Malaysia, Indonesia, Vietnam and Pakistan was at 40 percent of plans. Its North American factories, excluding Mexico, were working at 90 percent of plans. Toyota had just started to ramp up production in September, working overtime and some weekends to make up for output lost after the March 11 disasters. The supply constraints from the two disasters have hit Toyota's sales and market share the world over and will likely place it behind General Motors Co and Volkswagen AG this year. Toyota is still by far the most valuable, with a market capitalisation of $113 billion. Toyota must also find a way to keep its commitment of building at least 3 million vehicles annually in the shrinking Japanese market without bleeding profits. Toyota's shares have fallen 22 percent in the year to date, faring worse than Nissan, which is down about 8 percent, but better than Honda Motor Co, which has fallen 28 percent. Before the results were announced, Toyota shares closed down 1.7 percent at 2,503 yen, in line with the broader Tokyo market.